CM 8650 Light is primarily intended to be used where a quick-drying, lightweight alternative is needed. For use in homes, offices, public buildings and similar areas. CM 8650 Light is approved for use in marine environments. Suitable for stable substrates of concrete, ceramics, stone, steel, sheet metal or wood, where there is little risk of movement or deformation. Proper application thickness is 25-125 mm. Do not use product with underfloor heating due to its insulating properties. Minimum of 5 mm floor mortor is needed as underlay for carpeting. Reinforcement is needed for use on wood. The substrate should be clean and free of dust, cement skin, grease and other impurities that can prevent adhesion. Adhesion and surface resistance of the substrate should be no less than 0.5 MPa. Always prime the substrate with PP 600 and apply wet-in-wet. In terms of the primer forming a film, the temperature of the substrate must not fall below 10°C. For best results, the ambient temperature in the work area should be between 10 and 25°C. In terms of the formation of cracks due to shrinkage or potential settling, do not cover a concrete structure earlier than one month after pouring the concrete.The guiding value of 90% RH during construction should be set as an upper limit during the application of the product. CM 8650 Light is mixed with a max. 3.2 liters of water per 12.5 kg bag. Mix with a drilling machine with a whisk, and whisk until it becomes a stiff, lump-free compound that can be shaped into a ball in your hand. If the screed has started to dry out, do not try to mix in more water, rather discard the screed. Spread the blended compound on the floor and compress and swipe with the straight edge of a lath to a thickness of min 25 mm. In wet rooms with an slope, set a lath along the wall and pull the mortar toward the floor drain. Always properly seal the drains to avoid clogging the drainage lines. The screeded, compressed surface can be floated immediately. Before the screed has managed to fully cure, smooth the surface with a trowel. Do not allow the material to dry too quickly and protect it from evaporation, high temperatures, drafts, etc. by placing a plastic cover over it. Final finish can be done as soon as the surface has dried. Always make sure that the material is sufficiently dry before treating with a wet room membrane. 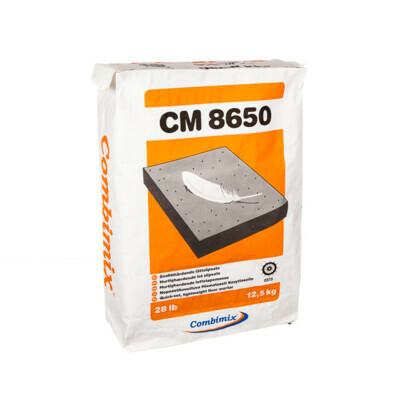 On dry substrates, the curing time in order to apply the wet room membrane is 8-16 hours after leveling with CM 8650 Light. The drying time specified assumes a curing environment with approximately 20°C, 40% RH and proper air flow. The curing time for laying carpet depends on what type of top spackling is used.